After a year of energetic fundraising, we set off on 3rd February 2014, to see for ourselves how things were going, and how the EMP money was being spent. This year things were slightly different, because we agreed that our 23 year old niece, Caitlin Dunn, would accompany us. Caitlin planned to take six months out for travel, and wanted to see what our enthusiasm for Buccama was all about. It was important to us that a young person would see the work, and we were happy to give her this opportunity. Caitlin would admit that her learning curve was steep, and her comfort zone was seriously expanded. However, it was a delight for us to see her grow in front of our eyes, adapt to conditions and food that were alien to her, and come through a pretty enthusiastic visit from a 24 hour bug! Despite all the strangeness she worked hard, and charmed everyone in equal measure. We loved having her with us. After a couple of days getting acclimatised in Addis Ababa, we set off for Buccama. It is a long and tiring drive, but that was soon forgotten, when we were riotously greeted by all the staff, and Mothers past and present. Singing, dancing, flowers and coffee are all part of the scene. It isn’t for show, and just made us feel incredibly welcome and glad to be back. Buccama Clinic works 7 days a week. There are 15 members of staff, and they rotate the duties. There are always 2 nurses on duty, day or night, although it seemed to us that they were all always there. They are paid the equivalent of £2000 pounds a year. Things have changed at Buccama. We learned on arrival that 5000 women had gone through the prolapse repair, but now the programme has been stopped. This is very sad, as it was such a fantastic programme, and brought relief to so many women. 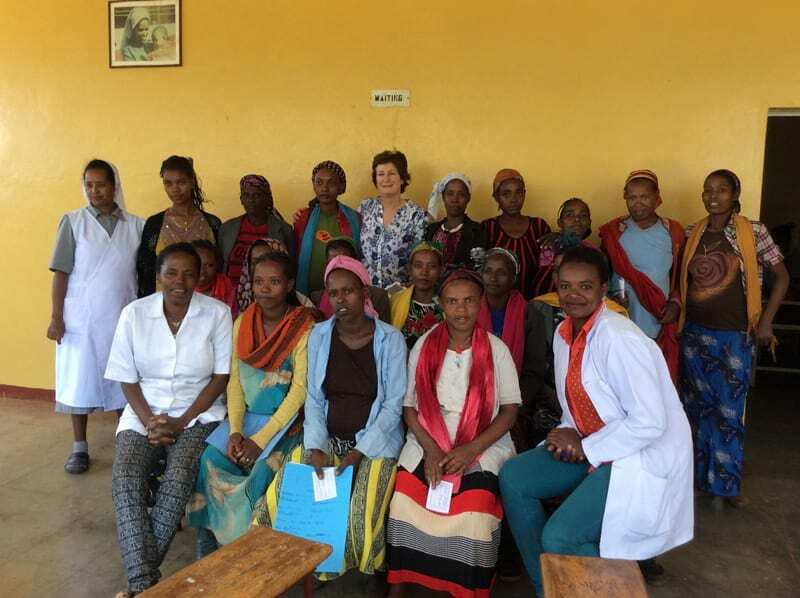 The work of EMP goes on however, because our involvement has always been to support the clinic and to restore the women to health. This is all still happening. We have also introduced and facilitated the use of pessaries, which in many cases, the women prefer, because with them, they do not have to undergo surgery. They are taught the value of the pessaries, and also how to use them. They are checked regularly, and know to come back to the clinic if they are unwell, or in any doubt. The very worst cases are still being taken to hospital, and we decided that EMP could fund these. The cost of an operation is in the region of only £80. The Government of Ethiopia has passed a law to say that there are to be no more “home” births. Therefore, the clinic has now become very busy, with ante-natal classes and new babies arriving everyday. There is a midwife now, which is a Godsend. She goes by the wonderful name of Wayneshet. She visits the mothers in their homes, before and after the birth. Each birth is greeted with great rejoicing, noise and clamour. We were very privileged to be allowed to take part in these births. Once again, the comparison with home is stark. The mothers labour without complaint. (Don’t make the mistake of thinking things are easier for them, they are not.) Their labours are just as tiring and difficult, they do it all without anaesthetic, and the only time they cannot control their pain is when they are cut, and stitched without pain relief. No fun, but the joy comes afterwards, and as ever, the pains of labour seem to be quickly forgotten. We loved this aspect of our visit; we massaged tummies, held lamps, scissors, hands and babies. We took two mothers to hospital, and for some reason were allowed to stay in the delivery room. I honestly believe that they didn’t know what to do with us, and we just went along with their quandary, because we wanted to stay and see everything. Birth is a messy, noisy and exhilarating business, and an incredible privilege to witness. Now there are 2 Josephs, 2 Maureens, 1 Josephina, and 1 Caitlin. All sweet, all perfect, and we wish them well in a life that will be far from easy. Meanwhile, the other business went on. We visited the “Elderly Destitute” for Michael’s House, one of our Associate charities, and started them off with their small pensions. We went back and forth to the hospital, collecting and delivering patients. On one of these visits, we met the most inspirational Dr Mark Karnes, a retired American Gynaecologist, working there for 5 years, as a volunteer, at the Christian Hospital with his wife. Dr Mark was delighted to visit Buccama, take a clinic, and give helpful advice. He also promised to stay involved, and take a clinic for the most difficult cases every two months or so: a tremendous connection for the clinic which we shall encourage. Our time raced by. 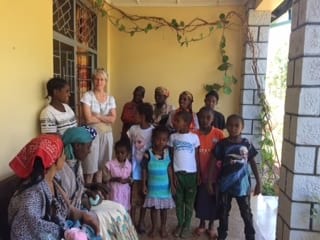 We marvelled at the strength and resilience of the clinic staff, and the patients, we laughed and played with the little children, we wept with relief when one new born baby seemed like he wouldn’t survive, and then suddenly breathed after a heart stopping 10 minutes effort to revive him. It really is hard to describe the combination of work, play and genuine goodness that we find there. Last year the fantastic £14.000 raised in 2013 by EMP fund raising, was spent on: pessaries, accommodation, food, blankets, transport, fuel, medicine and staff education. The projected needs for 2014/15 are broadly similar to 2013, although there are less prolapse mothers coming to the clinic, but many more new mothers and babies ,who need our help and money, for the most basic items ,but also more sophisticated and specialised kit like ultra sound and analgesics. This expanding little clinic works non stop to provide help for the surrounding community. It is an example of excellence. 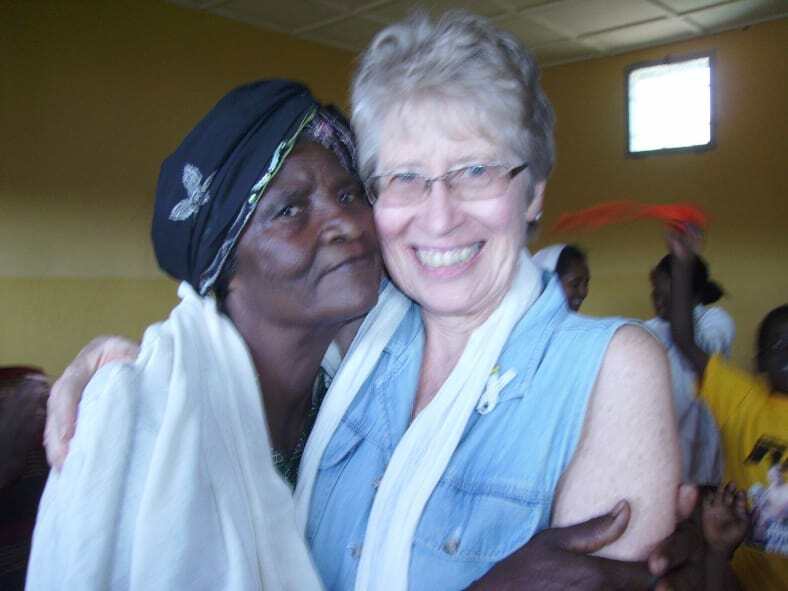 They are not completely dependent on EMP, but Maureen and I intend to help them in every way possible, and are already planning our year of fundraising, and can’t wait until we see them all again. We could not do it without the huge support that we have received from friends and family and hundreds of people that we shall probably never know. None of this would be possible without the untiring, unflagging, and outstanding leadership of Sister Haimanot and her team. The epitome of a Servant Leader.No wonder we all love her. With love and thanks to you all for your love, your MONEY! and your support.